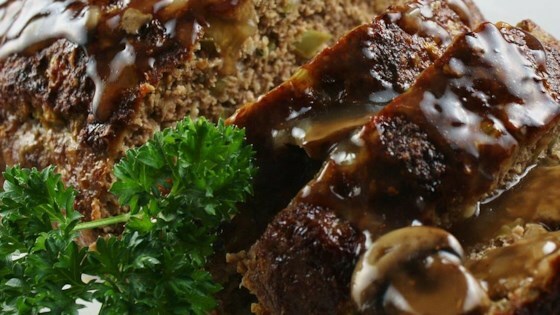 "My Grandmother 'Nanaw' Rowan made the most delicious meatloaf in the state. When she passed away, she didn't leave me her recipe, but she left me the desire to recreate it. I think this is it, in flavor and texture. Don't let the number of ingredients discourage you. It's part of the magic in creating a masterpiece!" Combine ketchup, brown sugar, and cider vinegar in a bowl; mix well. Preheat oven to 350 degrees F (175 degrees C). Spray two 9x5-inch loaf pans with cooking spray or line with aluminum foil for easier cleanup (see Cook's Note). Place onion and green pepper in covered microwave container and cook until softened, 1 to 2 minutes. Set aside to cool. In large mixing bowl, combine garlic, eggs, thyme, seasoned salt, black pepper, mustard, Worcestershire sauce, hot sauce, milk, and oats. Mix well. Stir in cooked onion and green pepper. Add ground beef, pork, and veal. With gloved hands, work all ingredients together until completely mixed and uniform. Divide meatloaf mixture in half and pat half of mixture into each prepared loaf pan. Brush loaves with half of the glaze; set remainder of glaze aside. Bake in preheated oven for 50 minutes. Remove pans from oven; carefully drain fat. Brush loaves with remaining glaze. Return to oven and bake for 10 minutes more. Remove pans from oven and allow meatloaf to stand for 15 minutes before slicing. You can also make one large loaf in a 9x13-inch pan. Bake for 60 to 70 minutes before brushing with glaze; continue to bake as directed. You may also use 1 pound ground veal and omit the pork. The brown sugar glaze is what takes this recipe from good and satisfying to outstanding and extraordinary! Please give it a try next time naples34102. Thank you for your review. very smooth excel. texture, suggestion in the glaze try 1oz tenn/kentucky whiskey mixed in.